on a recent trip to onterrible my cousin, Sunny told me that i needed watch the show "breaking bad." now, i had heard about this show, but as i dont really watch TV i didnt really pay it any attention. then, the wife was like "you gotta watch this breaking bad show, i got it on netflix." 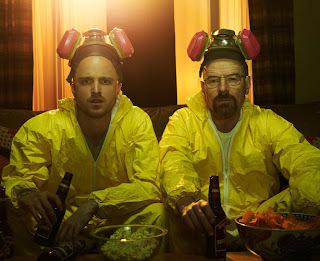 so for the next few weeks, the wife and i watched season 1, 2, 3 and are now on season 4. for those who havent heard of the show, its a story about a chemistry teacher who turns to making crystal meth, when he learns that he has cancer. "How is it?" you ask, well if you like stressed out, depressing, anxiety ridden shows you will love it. seinfeld nerds will recognize the main character as Dr. Tim whatley from the "anti dentite episode"
right up there with the Sopranos IMO!